It is sunset. The ground is silver. "Love" is ten feet above the ground. 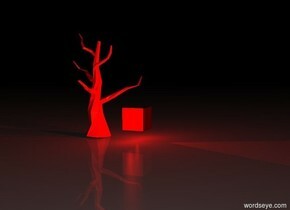 "Love" is red and reflective. The black heart is ten feet behind and two feet above "Love". The black heart is shiny. 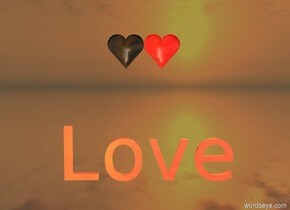 The red heart is ten feet behind and two feet above "Love". The red heart is shiny. It is night. "Fear" is black and reflective. The red light is three feet in front of "Fear". The second red light is three feet behind "Fear". The third red light is two feet to the left of "Fear". 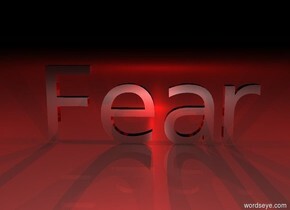 The fourth red light is two feet to the right of "Fear". The fifth red light is twenty feet behind and two feet above "Fear". "Knowledge" is one foot above the huge open book. The huge open book is ninety feet above the ground. "Learn" is ninety one feet above the ground. 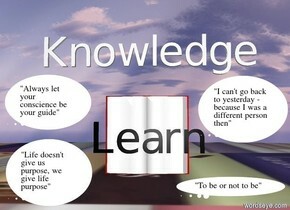 "Learn" is in front of the huge open book. "Learn" is facing south. "Learn" is black.. The ground is [writing]. "Hope" is in front of the big balloon. 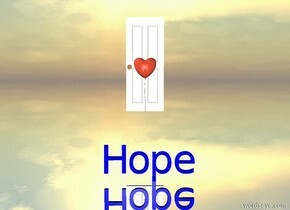 The balloon is one foot above "Hope". "Hope" is eight feet in front of the balloon. The ground is silver. "Hope" is blue. The open door is behind the balloon. The open door is one foot below the balloon. The ground is silver. 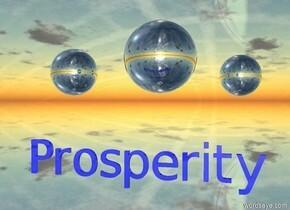 "Prosperity" is blue and shiny. The giant silver sphere is three feet behind and two feet above "Prosperity". The second giant silver sphere is five feet to the left and five feet behind the giant silver sphere. The third giant silver sphere is ten feet to the right and three feet behind the second giant silver sphere. "Prosperity" is three feet above the ground. It is night. "Shine" is black and shiny. 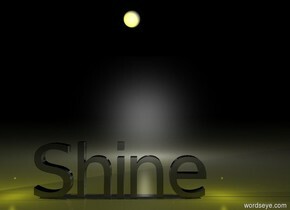 The yellow light is behind "Shine". The second yellow light is to the right of "Shine". The third yellow light is to the left of "Shine". The shiny white sphere is ten feet behind and six feet above "Shine". The small black wall is behind "Shine". The wall is reflective. It is sunset. "Courage" is thirty feet in front of the hill. The giant tiger is on top of the hill. The giant tiger is one foot in front of the hill. The yellow light is beneath the tiger. The red light is behind the tiger. The giant shield is two feet to the right of the tiger. The second giant shield is two feet to the left of the tiger. 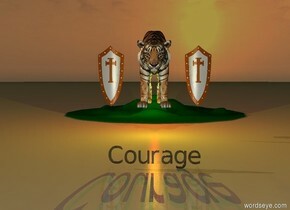 "Courage" is black and shiny. It is night. The giant reflective sphere is eight feet above the ground. The sphere is black. The reflective wall is behind the sphere. The wall is blue. The blue light is to the right of the sphere. The person is on the ground. The person is in front of the sphere. The person is facing the sphere. 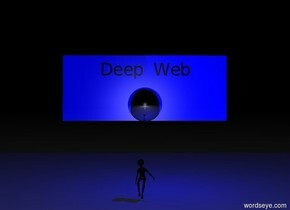 "Deep Web" is one foot above the sphere. "Deep Web" is black. It is sunset. 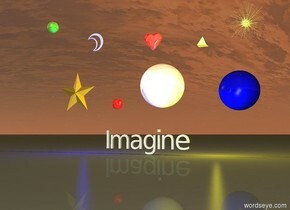 The giant reflective sphere is two feet above and two feet behind "Imagine". The shiny red sphere is two feet to the left of the reflective sphere. The giant blue sphere is two feet behind and two feet to the right of the reflective sphere. The giant sphere is dull. The big gold star is five feet to the left of the reflective sphere. 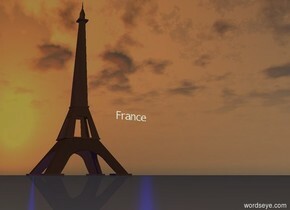 The huge yellow light is to the right of "Imagine". The moon is three feet behind and three feet above the star. The reflective heart is four feet to the right of the moon. The pyramid is four feet to the right of the heart. The huge blue light is to the left of "Imagine". The moon is two feet in front of the heart. The second reflective sphere is seven feet in front of the moon. The second reflective sphere is green. The second star is two feet to the right of the pyramid. It is night. 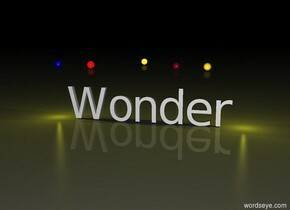 The yellow light is to the left of "Wonder". The other yellow light is to the right of "Wonder". The gold sphere is 30 feet behind "Wonder". The blue sphere is 20 feet to the left of the gold sphere. The orange sphere is 40 feet behind "Wonder" and 10 feet to the left of the gold sphere. The red sphere is 30 feet behind "Wonder" and 15 feet to the left of the gold sphere. The purple sphere is 30 feet behind "Wonder" and 3 feet to the left of the gold sphere. 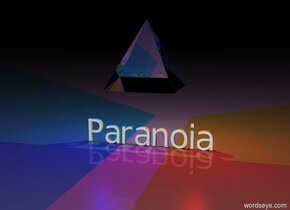 There is a giant glass pyramid 2 feet above "Paranoia". There is a big red light to the right of the pyramid. There is a big blue light to the left of the pyramid. There is a green light behind the pyramid. It is night. Three giant glass flames are behind "Desire". The three giant glass flames are red. The giant silver skull is to the right of "Desire". The other giant silver skull is to the left of "Desire". The giant chrome diamond is to the right of the rose. 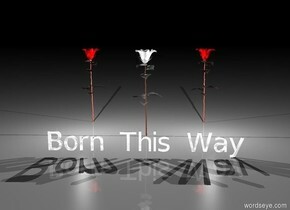 Small "Romance" is to the left of the rose. 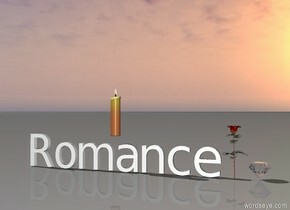 The big candle is above "Romance". The balloon is over the mirror. The chrome sphere is to the right of the balloon. The big tree was behind the mirror. 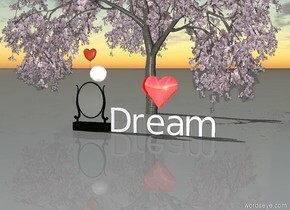 "Dream" was to the right of the mirror. A chrome heart was above "Dream". The heart is red.